48 MMS December 2016 mmsonline.com SHOP TALK BY M AT T DA N FO R D By the time the doors closed on the 30th edition of Bi-Mu/SFORTEC, the biennial Italian machine tool exhibition, 62,576 attendees had passed through the halls of the 90,000-square-meter Fieromilano Rho exhibition center in Milan. Although 41 percent of the 1,076 exhibitors hailed from abroad, Italian machine tool builders were naturally prevalent at the October 3-8 exhibition. And North America remains a prime target for their equip- ment, which trends large and is characterized by a high degree of sophistication and customization. According to f igure s highlighted by show promoter and Italian machine tool association UCIMU-Sistemi per Produrre, Nor th America remains the third most popular destination for machine tools and related products from Italy, which is the world's fourth largest producer and third largest exporter of such equipment. 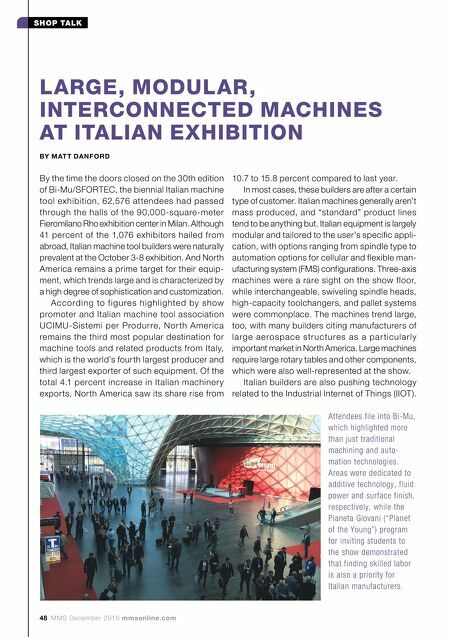 Of the total 4.1 percent increase in Italian machiner y exports, North America saw its share rise from LARGE, MODULAR, INTERCONNECTED MACHINES AT ITALIAN EXHIBITION Attendees file into Bi-Mu, which highlighted more than just traditional machining and auto- mation technologies. Areas were dedicated to additive technology, fluid power and surface finish, respectively, while the Pianeta Giovani ("Planet of the Young") program for inviting students to the show demonstrated that finding skilled labor is also a priority for Italian manufacturers. 10.7 to 15.8 percent compared to last year. In most cases, these builders are after a certain type of customer. Italian machines generally aren't mass produced, and "standard" product lines tend to be anything but. Italian equipment is largely modular and tailored to the user's specific appli- cation, with options ranging from spindle type to automation options for cellular and flexible man- ufacturing system (FMS) configurations. 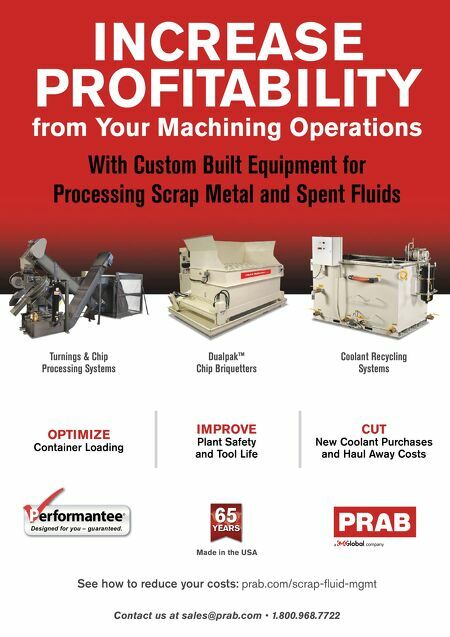 Three-axis machines were a rare sight on the show floor, while interchangeable, swiveling spindle heads, high-capacity toolchangers, and pallet systems were commonplace. The machines trend large, too, with many builders citing manufacturers of large aerospace structure s as a par ticularly important market in North America. Large machines require large rotary tables and other components, which were also well-represented at the show. Italian builders are also pushing technology related to the Industrial Internet of Things (IIOT).